Add TBM to your favourites! Enliven your Raya with new Home Electrical Appliances from Samsung's The Great Raya Offers, more amazing free gifts and unbeatable discounts start from 15 April until 16 June 2019. Don’t miss the chance to get a FREE Samsung Galaxy S10E when you purchase the 82" Q60 4K Smart QLED TV. 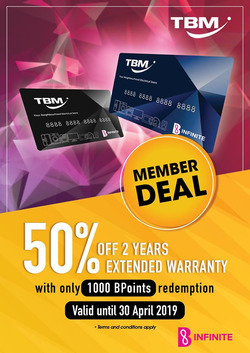 Special deal for TBM B Card members! 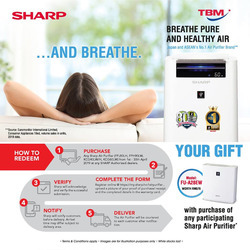 Purchase 1 unit of any participating Sharp Air Purifier, you'll get a complimentary gift - 1 unit of SHARP Air Purifier FU-A28EW worth RM579. Check this promo and save your money to buy Electrical Appliances all at once! Spend as low as RM3000 in total bill and use voucher code MYNEWHOUSE to slash 10% off the bill! TBM or Tan Boon Ming Sdn. Bhd is a preferred electrical chain store offering a variety of electrical appliances including audio video products, home appliances, kitchen appliances, beauty/personal care products, office automation products, digital lfestyle products and electrical accessories. TBM's tagline is 'Everything plus a Smile!' which represents the business' simple strategy - work very hard, smile often and give something extra if we can. TBM also offers installation services, repair services, spare parts, free delivery, product recycling and free advice/consultation services. Follow TBM on Facebook for all the latest product updates, events and promotions. TBM Electronic and Electrical Stores offer more than 30 well known brands including Electrolux, Sharp, Vitamax, Dyson, Samsung, Sony and many more. Tan Boon Ming started his business in 1945, before he got married and just after World War II. It was a small shop dealing in bicycles. He only registered Syarikat Tan Boon Ming in 1953 because back then very few people registered their businesses. There are currently 8 TBM outlets located in Klang Valley. TBM's logo is a smile, complete with a dimple. Simple, easy to recognize, signifying happiness. Do you want to receive more offers from TBM by email?